Last weekend Megan and I spent two nights in Las Vegas at The Venetian followed by one night at the Hyatt Place. 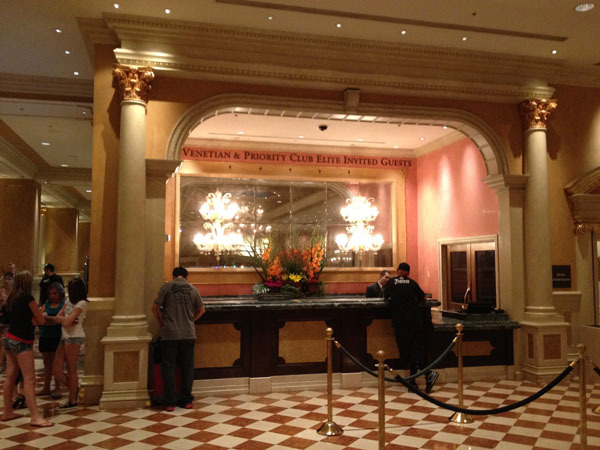 I’ve been to Vegas several times before, and I have to say that The Venetian is one of the nicer places I’ve stayed. However… It was a continuous experience of missed expectations. I much preferred our stay at the Hyatt Place, which under-promised and over-delivered (more in a separate post). Setting and meeting expectations are key to earning my approval, not just trying to create as much bling as possible to lure spendthrift gamblers and partiers. But then, maybe a logical evaluation isn’t appropriate for a destination such as this. 😉 When we go to Vegas, the pool and food are our top priorities, which may not agree with yours. I purchased 60,000 Priority Club points earlier this year when they were offering a 50% bonus as a bid to earn Priority Club Platinum status and parlay that into a Hyatt Diamond trial. I didn’t know what I would do with the points at the time but got my answer when The Venetian casino, an InterContinental Alliance Resort, announced a sale on award nights for only 25,000 points each instead of the usual 50,000. I also have Ambassador status with InterContinental Hotels, for which I paid $200 and got a few other benefits. Elite members with Priority Club are allowed to use an expedited check-in area at the hotel for invited guests, but only Ambassador and Royal Ambassador members get a room upgrade or late check-out. Royal Ambassador’s also get a $100 minibar credit per stay. We were through the check-in line in under 5 minutes, were provided a larger suite on the 27th floor with a view of the Strip and a late check-out at 4 PM (I was offered 2 PM, but it was extended without any hassle). Due to construction in the Casino, the hallway to the elevators was congested throughout our stay, but they did arrive quickly. The room itself was very spacious and designed to look ornate. Marble everywhere, a large king bed, L-shaped sofa, and lots of sconces. I liked the layout of the furniture, which was comfortable, useful, and relatively easy to navigate around. I would have preferred desk were turned toward the window to provide a view when working and avoid glare from the window. It also came with a printer and scanner, which I found a nice touch for business travelers (The Venetian is attached to a giant convention center). Now for the complaints. Although our room looked like it was trying very hard to impress, it failed in the basics. Lets start with lights. The two obvious light switches only controlled two chandeliers at opposite ends of the room. The bedside lamps were controlled from two convenient switches located only on one side of the bed. Other lamps were in strange places, like under the marbled plastic of the console tables. And the amount of light was horrible! I understand they were trying to be “green” with fluorescent lamps, but they took forever to turn on. We ended up leaving all the lights on in our room all the time. Otherwise we would have to plan a trip to the restroom five minutes in advance. 😛 In contrast, lighting at the sinks was by overhead halogen bulbs, which created a glare that made it difficult to shave or apply makeup. Next, the noise, noise, NOISE! Our view of the Strip meant we also overlooked the pools and the TAO Beach Club, which was thumping from noon to six every day. After six, you could hear the cannons from the pirate show across the street. And at night, there were fights, drunken revelers, and who knows what making a fuss in our hallway. I’m lucky I brought earplugs, but Megan didn’t get much sleep. Finally, the amenities. The main room got mostly praise, but not the bathroom. For a room with two people, we were provided three towels. I can understand two, I would prefer four, but three is very odd. Racks for the hand towels were the round kind and had detached from their holder, revealing an ugly-looking gap and rolling about with a screeching noise. Water pressure was fine in the shower but incredibly weak in the toilet–half the time it wouldn’t flush. And Megan managed to break off the handle of a sink faucet! As for aesthetics, four different colors of metal-tinted plastic around the vanity and elsewhere made for a chaotic and cheap appearance. There are lots of them. They’re mostly just big rectangles. And it’s hard to stay wet when they are only four feet deep. Chairs and shade in the 110-degree heat were also hard to find. Overall they were just good for a quick dip before heading inside unless you wanted to tan. And listen to the thumping music from TAO. We spent about an hour or less each day in the water. Cocktails at the pool bar were $15 each and basically eight ounces of flavored water, similar to our experience at the MGM Grand a few years prior. You also can’t take your drinks farther than the pool’s edge, unlike at MGM-owned hotels that couldn’t care less. Although the MGM Grand has a nice river pool that gives you something to do in the water, we both decided we liked Mirage’s pool better. There’s lots of shade available, the waterfall provides some entertainment, and for $20 you can get a ginormous mojito that will actually get you buzzed. The Venetian and The Palazzo have many fine restaurants, which is one reason I wanted to stay there. On this trip, in fact, we were wandering about wondering what we should do one night and decided we would have more fun having cocktails upstairs at Bouchon than we would in the casino. We ate at Bouchon on our previous trip to Las Vegas when we stayed at The Mirage across the street, and it was very good with an excellent waiter. One note of caution, however: about half of the tables are pretty undesirable, including the booths along the bar and the far wall. Request a table in the middle or by the windows. In fact, request your waiter, too, because we got a dud during dinner Friday night who pretty much ignored us during our entire evening and didn’t even bother to explain the specials. I was very happy to recognize our waiter from our first visit a year before when we returned on Saturday night for cocktails, and I got his name for future visits. Brunch was a model of excess. First came the epi bread, which you’ll get with every meal at Bouchon (unfortunately, it was under baked at brunch, cold at dinner, but perfect during cocktails) along with some fresh strawberry jam. Megan’s bacon-and-eggs entrée came with a delicious pecan sticky bun, and I ordered the famous chicken and waffles after being told by four different waiters. I’d never had chicken and waffles before, but it was a good experience. The only strange thing was that the waffles were savory, with bacon and chives, and the combination with sweet vanilla butter and maple syrup was unsettling. It went much better with the chicken than alone, which I guess is the point. But we didn’t just eat at Bouchon. We also went to B&B Ristorante, an Italian restaurant by Mario Batali and Joe Bastianich on the main restaurant row. This resulted in much more noise from the nearby casino and pop music in the hallway, which was unfortunate, but the setting inside among the wine racks was cozy. The service was nearly infallible, and the food prices were reasonable, but beware the wine list. Over 90% were over $100 a bottle, far beyond our budget, but we still ended up with something decent. The food was more memorable than at Bouchon. We were on a search for good tomatoes that weekend, and I was disappointed when my tomato salad at Bouchon was effectively some mushy red things in ranch dressing. B&B did much better with its caprese. We each got ravioli for our mains, Megan choosing one containing bone marrow and a side of beef brisket and mine containing beef cheek with a foie gras sauce. The only thing disappointing about the meal was dessert (incredibly so), which we probably shouldn’t have been eating anyway after the rest of our meal! Overall we enjoyed our time at The Venetian enough that we didn’t feel like we had wasted our points. But only because it was a points stay at 50% off. We heard some rave reviews about Wynn and Encore while we were at the airport, and I still mean to stay at Bellagio (although the remodeled rooms seem a inconsistent with the rest of the design). But the next time we return, it will probably be to Mirage, which managed to be both affordable and fun while still giving us a taste of luxury. The Venetian, by contrast, was trying to create an image that seemed to appeal mostly to foreign tourists and those with too much money who were more interested in a non-stop rave than enjoying a relaxing weekend.